Shams ud-Dīn Amir Kulal’s father, Amir Saif ud-Dīn Hamza (امیر سیف الدین حمزہ) was head of the Kulal Tribe and a direct descendant of Husain ibn Ali, grandson of Muhammad. In fact the entire tribe of Kulal had descended from Muhammad and settled at Vabkent (Wabkana)–30 kilometers north of Bukhara. Around 1340 the city was visited by Ibn Battuta (1304–1359) who spent a night there as a guest. Ibn Battuta described the small city of Vabkent as beautiful with many gardens and rivers. Kulal Tribe had settled at Vabkent a number of generations back, near the end of the twelfth century. Their date of settlement can be approximated with the madrasa which was constructed at Vabkent in 1198 under the patronage of Burhan ud-Din Abdul Aziz II, whose name adorns madrasa’s minaret, the only surviving segment of the building. It is interesting to note here that the engineers working on construction of the madrasa were all from the Kulal Tribe and copied the Kalyan Mosque (Po-i-Kalyan) style, though few upgrades were made in the design and technology. In essence the Vabkent Madrasa was a more refined form of Kalyan Mosque. Kulal Tribe quickly established a small industrial base at the central market of Vabkent and number of mills in the surrounding areas which continued to operate well into the sixteenth century. Minting of coins, steel, pottery and milling were the main industries. Though, the highly glazed pottery and tiles, unmatched in quality and quantity were their main export earning them the title of Kulal (potter). Their kiln designs were highly efficient and were able to produce up to 1500 pots in each batch. Utilizing wind and water resources for milling and industrial processes coupled with efficient kiln designs resulted in considerably higher returns per capita leading to a healthy lifestyle for the entire tribe. Kulal Tribe lived in the surroundings of Burkhara and Bukhara city amidst the most turbulent times but remained safe and stayed out of the line of fire. Never in their history of few centuries were they attacked or their stronghold city destroyed. The reason lied in the threefold strategy. Firstly, they were famous as an entire tribe of descendants of Muhammad, attracting considerable respect from the neighbouring tribes, thus anyone bad-eyeing them had to think twice-the entire region being a Muslim dominated country. Secondly, the city was surrounded by a terrain of gardens and greenery criss-crossed by numerous rivers and streams at one side and an endless desert at the other, which was barren and uninhabited. This coupled with nothing much of material value in the small city was big enough deterrent for any invading army which would have to travel at least one day to reach the city which lied at the boundary of Kyzyl Kum (Qyzlqum) desert and no major city to north of the city. Shams ud-Dīn Kulal was elected as tribe’s head after his father’s death. Although all the heads of Kulal were called Amir-i-Kulal (meaning chief of Kulal tribe), it was Shams ud-Dīn whose name has become synonymous with the designation Amir Kulal. Today he is mostly remembered through the title Amir Kulal rather than his real name. As head of Kulal, his responsibilities increased but Sayyid Amir al-Kulal (KS) continued to teach at the madrasa. One of Sayyid Amir al-Kulal’s (KS) most famous disciples was Shah Bahauddin Naqshband al-Bukhari (KS) who used to work as an executioner in Bukhara under the rule of Qazan Khan ibn Yasaur (d. 1346). One day Shah Bahauddīn (KS) was ordered to execute a man who had angered the king. However, right before his execution the accused called upon Sayyid Amir al-Kulal, identifying him as his teacher. Amir Kulal intervened and the accused was set free on his intercession. This was Shah Baha uddīn’s (KS) first encounter with Amir Kulal (KS). Impressed by him, Shah Bahauddīn (KS) became his student. Amir Kulal also had a sizeable following of spiritual protégés (murid). Of these the most prominent was Turghai (Trush) (d. 1356 AD) who had previously been influenced by Amir Kulal’s grandfather. After Turghai’s death his son Timur (d. 807/1405) held Amir Kulal in the same esteem holding him as his spiritual guide. Around the year 1340 Ibn Battuta made a day stop at Vabkent who later described the city as beautiful with many rivers and gardens. He was Amir’s guest at the city and was guided towards Bukhara, then at a day’s travel from Vabkent. In the year 1357 Timur approached Amir Kulal (KS) for his advice on strategic manoeuvres for attacking Uzbeks. It was under his advice that Timur changed his attack plan. None of the books written by Amir Kulal (KS) are extant. However, some excerpts and essays have survived in the family library. Also, three copies of a biography of Amir Kulal “Maqamat-i-Amir Kulal” written by his great grandson Shihab ul-Dīn have survived. Sheikh Kulal (KS) followed Sheikh Samasi (KS) for 20 years, spending all his time in Dhikr, seclusion, worship, and self-denial. No one saw him in these 20 years except in the company of his sheikh. He would come to see his sheikh in Samas every Monday and Thursday, although the distance was five miles and the journey difficult, until he reached a state of unveiling (mukashafa). At that time his fame began to spread everywhere until he left this world. He had four children, as-Sayyid al-Amir Burhanuddin, as-Sayyid al-Amir Hamza, as-Sayyid al-Amir Shah, and as-Sayyid al-Amir ‘Umar (KS). He also had four khalifs, but he passed his secrets to only one of them, the Master of Masters, the Knower of Knowers, the Greatest of Arch-Intercessors (al-Ghawth al-Azam), the Sultan of the Saints, Shah Sheikh Muhammad Bahauddin Shah Naqshband (KS). Amir Kulal (KS) died in 772/1370 and was buried in Sukhar (Sokhar) near Bukhara. 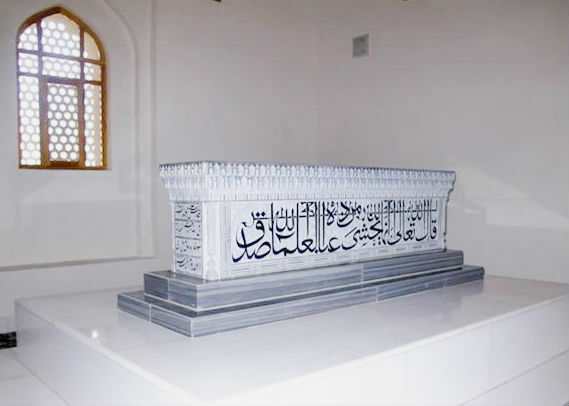 Sometimes Amir Kulal’s tomb is confused with the tomb of his grandfather (also Shams ud-Dīn Kulal). It is Shams ud-Dīn Kulal (Amir Kulal’s grandfather) who is buried at Shahrisabz(Kesh); the Green City. Amir Kulal’s grandfather had constructed the madrasa Dor-i-Tilavat/Dorut Tilavat (House of Mediation) and was buried here after his death. Later, Timur transferred the body of his father Turghai, to be near the grave of Shams ud-Dīn (Amir Kulal’s grandfather). Amir Kulal’s grandfather was Turghai and Barlas Tribe’s spiritual mentor. Majority of Timur’s family is also buried at the same place. 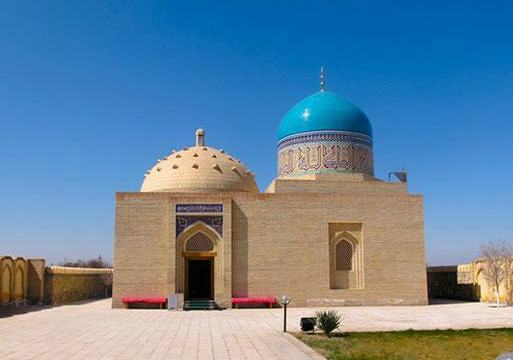 Recently, his tomb had been renovated under the orders of Uzbekistan’s President. Sheikh Sayyid Amir Kulal (KS) died in the same village in which he was born, Sukhar, the 8th of Jumada al-Awwal, 772 H.
Bir hurmat habib bir hurmati anzalta Surat al-Fatiha!